Finally, I can share my Christmas knitting with the world! Jason's mother, Shirley, made our huppah. In fact, she made a huppah for each of her three kids' weddings. Each one of them involved hours upon hours of consulting with the bride and groom, designing, hand-dying silk, and sewing. And though each one of them is a work of art, I'm partial to ours. Obviously, by the time it was all said and done I wanted to knit Shirley something really special. 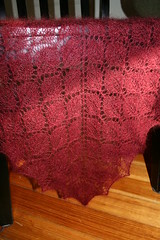 I knew the Leaf Lace Shawl was the right pattern as soon as I saw it: leaves everywhere -- just like our huppah. And once the pattern was settled I knew it had to be red, since my fascination with the rich, brilliant red of autumn leaves was an inspiration when Shirley was designing the huppah. 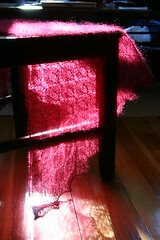 What I don't know is why I settled on Kid Silk Haze (color: Liquer) for my first real attempt at a large lace project. I wanted to finish the shawl it in time for the wedding weekend in early October. Hypnotized by how quickly the first 30 or so rows went, I really thought I could do it. As the wedding drew nearer and the rows got longer, I grew more distractable and made more mistakes. Knitting mistakes are normally no big deal for me (just un-do and re-do!) but with the Kid Silk Haze? It's a beautiful, luxurious yarn that makes delightful, gauzy fabric -- but it's a b*tch to rip. So I Did the Right Thing. I put the shawl down, and didn't come back to it until after the wedding when I could give it my full attention. And when I did, I became a compulsive life-line user, did away with all but the most necessary stitch markers, and printed out a bunch of copies of the lace chart that I could highlight (when I was working on a row) and cross off (when it was finished). In short, I became an enormous lace-knitting nerd. Shirley was pleasantly surprised to get the shawl, and immediately got the connection between the red leaves. I hope she enjoys it! The Lace Leaf Pattern is an excellent pattern, even for first-time shawl makers. Embrace your inner lace-knitting nerd; if you can't do that, at least use a lifeline for Pete's sake. Beautiful! And the Chuppah is GORGEOUS! What a keepsake. 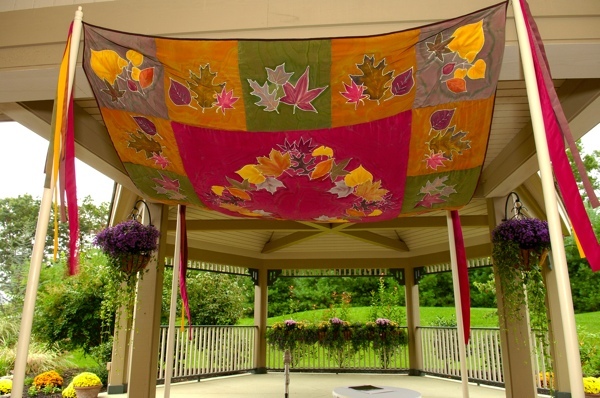 Can you use is as a quilt or a wall hanging? Really wonderful. 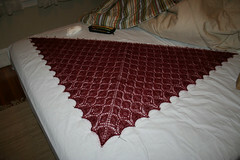 The lace leaf shawl is AMAZING and I really appreciate the thoughtfulness and hard work that went into it. I'll cherish it! Thank you again. I am in awe of the huppah.......seriously!!! The huppah is beautiful as I've mentioned before. The shawl is simply amazing and gorgeous! What a great job Shannon. Hopefully you will still be knitting away if/when someone agrees to conceive with one of our sons! Ooooh, it looks gorgeous! What a beautiful project. It's nice to make something so special after she made you two that wonderful chuppa.